A full copy of the letter is available. There’s nothing wrong with student dissent or student demands for changes in society or the display of student unhappiness over aspects of our national policy. 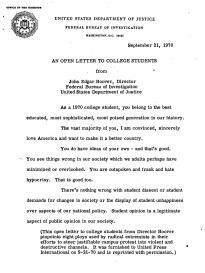 Student opinion is a legitimate aspect of public opinion in our society. . . . But there is real ground for concern about the extremism which led to violence, lawlessness, and disrespect for the rights of others on many college campuses during the past year. The extremists are a small minority of students and faculty members who have lost faith in America. They ridicule the flag, poke fun at American institutions, seek to destroy our society. They are not interested in genuine reform. They take advantage of the tensions, strife, and often legitimate frustrations of students to promote campus chaos. They have no rational, intelligent plan of the future either for the university or the Nation. . . .
They’ll encourage you to lose respect for your parents and the older generation. . . .
They’ll ask you to abandon your basic common sense. . . .
They’ll try to envelop you in a mood of negativism, pessimism, and alienation toward yourself, your school, your Nation. . . .
They’ll encourage you to disrespect the law and hate the law enforcement officer. . . .
They’ll tell you that any action is honorable and right if it’s “sincere” or “idealistic” in motivation. . . .
They’ll ask you to believe that you, as a student and citizen, are powerless by democratic means to effect change in our society. . . .
They’ll encourage you to hurl bricks and stones instead of logical argument at those who disagree with your views. . . .